Last October, I had the pleasure of attending a screening of the romantic comedy Life As We Know It with my husband. We both enjoyed the film very much, to my husband's surprise. Well, the Blu-ray/DVD combo for this movie is due to hit stores on February 8th, 2011! I highly recommend this movie if you are planning a dinner and a movie at home for Valentine's Day or any date night. You can read my review of Life As We Know It here on 3G2S. As I had stated in my review, I am a huge fan of Josh Duhamel. His character Messer (the bad boy bachelor) and the sweet responsible Holly (played by Katherine Heigl) successfully prove that there really is a fine line between love and hate. This movie is a great comedy with just a hint of romance, making it perfectly entertaining for both men and women. Here is a sneak peak, if you have not seen the trailer . . . Available on Blu-ray Combo Pack, DVD, On Demand and for Download beginning 2/8 from the WBshop.com, Amazon.com , and most major retailers of popular movies. Thank you to Warner Bros. Entertainment for providing a copy of this movie for our contest prize and for also sending me one as a thank you for participating in this campaign. 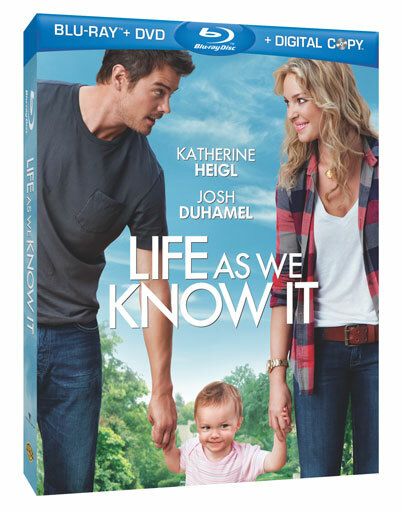 One lucky reader will receive a copy of "Life As We Know It" on Blu-ray + DVD. Watch the short trailer above for Life As We Know It. Then leave a comment telling me which scene you thought was the funniest. You MUST do this to be eligible to win this contest. 3) For 10 extra entries, join the Warner Bros. Email List. Then come back here and leave TEN separate comments telling me you did. 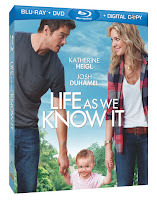 5) For 1 extra entry, "Like" Life As We Know It on Facebook. Then leave a comment with the link to your Facebook profile.